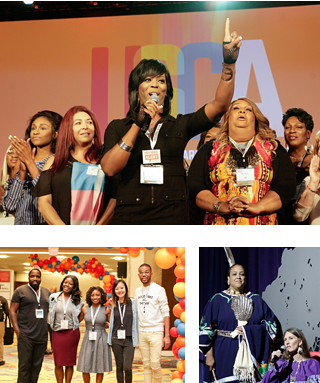 How Do I Get To The 2018 USCA? 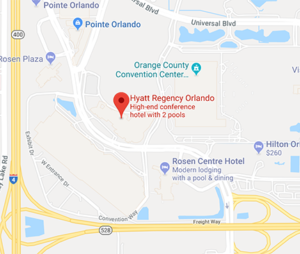 Orlando International Airport is approximately 12 miles away from the Hyatt Regency Orlando and the most accessible airport to the conference venue. It is suggested that attendees allocate $59 as a daily food allowance (based on the GSA per diem rate for Orlando). What is the Dress Code for USCA? The dress code for USCA is business casual attire during the conference. What Is The Protest Policy? Limit all demonstrations in the conference exhibit hall to the hours of 10:00 am and 2:00 pm. Limit all demonstrations to no more than 15 minutes. Hold no more than one demonstration per day. NMAC reserves the right to determine whether a demonstration is disruptive and/or detrimental to the mission and values of USCA. We appreciate the need for freedom of expression. We also want to balance this need with the needs of our constituents, sponsors, and exhibitors to ensure that USCA is productive for everyone. As such, we require all attendees to follow these policies. If you do not, you may be escorted out of the conference and banned from attending future NMAC sponsored conferences. Only conference registrants can make a hotel reservation at the special 2018 USCA rate. You must submit a paid USCA registration first to be able to make a hotel registration. Your confirmation email will include a link to make a reservation at the hotel. Please do not contact the hotel directly as the Hyatt Regency Orlando will only reserve rooms for registered attendees that have been confirmed by NMAC. For more information about the hotel, please visit http://2018usca.org/our-venue. Submissions are accepted through the online portal only. The submission deadline is Friday, April 6, 2018. To submit an abstract please follow the instructions listed on the Abstract Tab. How Do I Schedule an Affinity Session? Affinity sessions are meetings of conference attendees who want to discuss a particular subject. To schedule an affinity session use the link below. Confirmation of your Affinity session will be sent in August. 2018 USCA is proudly offering Continuing Education Units (CEUs) for attendees seeking hours toward maintaining or attaining certifications. Through the National Commission for Health Education Credentialing, USCA will offer Community Health Education Specialist (CHES) credits. Through the National Association of Social Workers (NASW), we are offering a maximum of 1.8 Social Worker CEUs. USCA is also offering 2.1 General CEUs from George Mason University. While USCA offers courses for CEUs, please be sure to verify that your credentialing organization will accept the credits from these institutions. Sign-up to recieve CEUs at the CEUs desk at On-site Registration on the Lobby Level. What are the Incidental Cost at the Hyatt Regency Orlando? The Hyatt Regency Orlando has a $70 incidental hold per night, the hold is then released at check out. For credit card holders the amount released will take 3-5 business days. For debit card holders, the hold is automatically withdrawn from the primary account and is released 7-10 business days after check out. Individuals with debit cards are given one of two options at check in. Guest may leave their credit or debit card on file and occurred a $70 night hold per night OR guest may pay the full amount of room and taxes and incidentals upon check in. The front desk of the Hyatt Regency Orlando desk does take cash deposits in the total amount of room and taxes of guests stay. If a guest is staying for 5 nights and already has room and tax covered the guest would be charged $350 up front. The front desk is also able to turn off guest room charges if a guest does not have a credit card.